If you downloaded a file containing translations of categories from the Little Reader English Curriculum, it is most likely that the file was created by directly translating the English version, without saving words as separate or duplicate "word files." In short, the translated word has exactly the same file name as the original English word. You can try asking the file author about this, and request that she edit her file and update her uploaded file to avoid more people from getting the same problem. 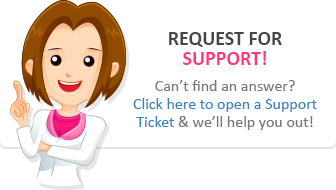 If you are unsure, please do report the problem to any Forum Administrator or Moderator, or send us a message using our Contact Form. If you created your own translations for your English categories in the same way described above, you are likely to encounter the same problem in your English Curriculum (try to check the sessions where words from those particular categories are used). By default, Little Reader's Import options are set in such a way that any Word, Category or Playlist in the file being imported that conflicts with the one(s) you currently have in your Little Reader will "Replace" the pre-existing content. This means that since the file you are importing has the same word / category / playlist file names as the ones from your English Curriculum, Little Reader will replace or overwrite some of your English Curriculum content with the ones from the files you import. Open the file you want to import, and in the "Importing..." pop up, click on "Show advanced options"
Replace - This will overwrite the Course / Playlist / Category, Word, or media file you currently have with the one being imported. Combine - This will make Little Reader add the newly imported files to the ones you currently have (e.g., if you changed the pictures for "dog," you'll end up having the default pictures + your own pictures). Rename - This will rename the file(s) being imported so that it appears as a separate Category or Playlist in your Little Reader. 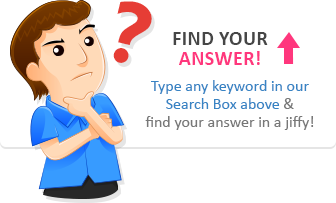 This means you will have your personalized version of the word/category, and then another version that has the default content or setting. Replace if same size, otherwise Rename (available for "Media file name conflict" only) - if the media file being imported has the same file name as the one you currently have, the file will be replaced only if the file sizes are the same. Otherwise if the sizes are different, the file will be renamed and combined with the one you currently have. 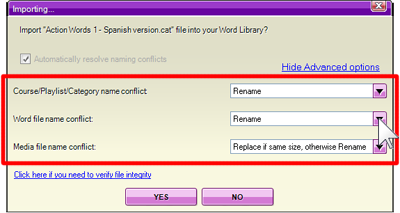 TIP: If you'd like to make Little Reader rename ALL conflicting words, categories, playlists, or courses, you may choose Rename for both "Course/Playlist/Category name conflict" and "Word file name conflict" and select your preferred import option for "Media file name conflict" (or leave it as is). Unfortunately, there is no way to retrieve the cotent that was overwritten after these have been replaced by the file you have imported, unless you were able to save a "clean" backup of your Little Reader database, or if you exported your personalized files before and saved these in your computer. If you do have backup files (from before you imported the problematic files), you can simply re-import those files to re-overwrite the affected words / categories / playlists and restore your Little Reader English content to its original state. In case you find that your playback settings were reset or changed after importing any file, you can just redo your changes.